After escaping from the clutches of the monstrous Bergens over a decade ago, the happy-go-lucky Trolls live in musically infectious joy, seemingly clueless to the dangers lurking just outside their hidden sanctuary. But after a glitter-filled party inadvertently catches the eye of the disgraced former Chef (voiced by Christine Baranski) of the Bergen leader King Gristle, Jr. (Christopher Mintz-Plasse), it falls to perky Troll Princess Poppy (Anne Kendrick) to try and save a group of her friends who have been kidnapped from the village. She enlists the help of the oddly grumpy Branch (Justin Timberlake), a survivalist who knows how to take care of himself, the pair making the arduous trip through the forest to the Bergen city in order to make sure no Troll gets eaten for Sunday dinner. Okay. Where to begin. Created in 1959 by Danish fisherman Thomas Dam, Trolls are a global sensation, and while the popularity of the toy isn’t quite up there with the likes of Barbie, G.I. Joe or the Smurfs, the fact they’re maybe a notch or two below still makes the funky-haired plastic figures a bona fide phenomenon. 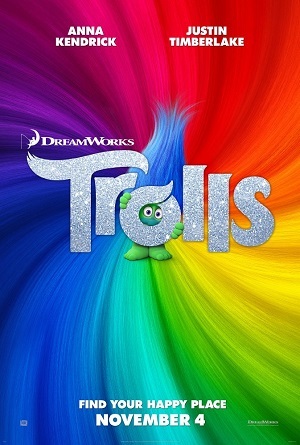 Now, almost 60 years after their invention, DreamWorks has seen fit to produce a musical adventure revolving around the dolls, the new CG-animated Trolls supposedly a bouncy frolic into their neon-colored world. The good news? The soundtrack is put together by executive music producer and vocal actor Timberlake and it is pretty darn wondrous, the songs a catchy collection of new material and familiar favorites. In fact, I’ll go out on a limb and state it’s pretty much a given that the catchy pop dance track “Can’t Stop the Feeling,” performed in the film by Kendrick and Timberlake, is going to get an Oscar nomination. Not only is it terrific, but its use inside the movie is wonderful, producing mass smiles from the audience (as well as a number of toe taps) with relative ease. Additionally, the animation is incredible, the feature having a unique look and feel that suits the characters as well as the world they live in perfectly. I don’t have any other good news. While I cannot say I the film is as flat-out terrible as say Norm of the North or The Angry Birds Movie were, that doesn’t mean watching this elongated toy commercial meets music video come to life was my idea of a good time. Mixing elements of The Smurfs, “Fraggle Rock” and “Adventure Time,” Trolls is a hyperbolic, energetically pointless exercise in tedium that gets more and more tiresome as it goes along. The script is a nonsensical, unappealing disaster, the characters one-dimensionally unimaginative and the humor is both annoyingly constant as well as shockingly unappealing. It is amazing just how wasted much of the talented roster of vocal talent proves to be. Other than Kendrick and Timberlake, both of whom are much better than the material, and maybe to a lesser extent Baranski, Mintz-Plasse and Zooey Deschanel (as a royal maid with the hots for King Gristle), all three of whom at least have something to do, the remainder are left continually high and dry. Russell Brand, Gwen Stefani, John Cleese, Jeffrey Tambor, James Corden, Ron Funches, Quvenzhané Wallis and Icona Pop members Caroline Hjelt and Aino Jawo are left high and dry, none of them utilized remotely well thus making their collective presence all but meaningless. I did laugh a couple of times, and, as already stated, the climactic musical number did make me smile. Additionally, Kendrick and Timberlake have naturalistic charm, so much of it I’d love to see the two reunite in a live-action feature at some point in order to see if there’s something substantive between them worthy of additional exploration. None of it is enough to make me ever want to give Trolls another chance, of course, the film so obnoxiously unappetizing the thought of sitting through it again makes my skin crawl. I didn’t like it, not at all, and while I’m certain there are kids out there who will undoubtedly feel differently don’t expect me to sing a different tune on the matter anytime soon.